OUR PRICE: $19.26 - Join Rewards Get $1 Dance Dollars On This Item! I ordered a child's XL for my daughter who wears a size 2 street shoe. The XL was way too small for her. My daughter is 10 and wears a size 3 in regular shoes. 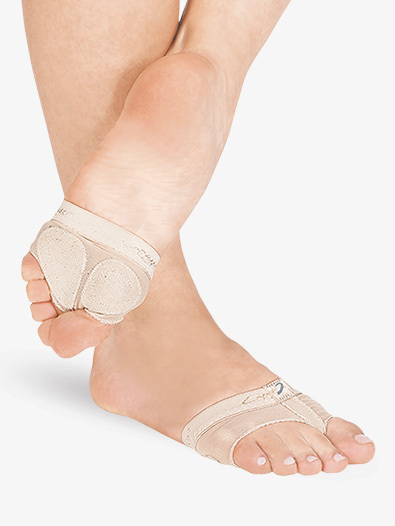 I have purchased Capezio Footundiez at a Dance store before, and they fit just fine. This time, when I ordered online I made a mistake of ordering the Child Medium, Style H07C, instead of Adult Medium, Style H07. Child Medium is extremely small-narrow. I am not sure it would fit an average child who wears size 11-12, unless they are very small with a narrow foot. It's best to try them on in the store before purchasing online. Just as the title states "Girls" this is intended for young girls. I ordered a large and when it arrived it looked like it was meant for a doll, but it fit perfectly on my daughter's size 1 feet. As far as durability, I don't know yet as she just wore them once. She did say they were comfortable and had problem with lyrical moves. I would say Large is shoe size 12-1, XL 1-3 and the others size accordingly. these run small, which is great for my younger dancers with skinny feet. we all know they don't hold up well, but they are inexpensive. could they be any smaller ?! I followed the size chart & reviews so I ordered large for my daughter, she wears a child's 13-1, ordered a child's XL, couldn't even get 3 toes in it. She needs them & who knows how long it will take to exchange them. Total disappointment. I ordered these based on the sizing guide provided. Big mistake. The sizing guide says a child 2-3 street size would be a Child XL. They were too small to fit on my daughter's toes. What really aggravates me is that I now have to pay to ship them back AND pay for shipping for another pair! This will definitely be an issue going forward and may make me rethink my Discountdance.com purchases. Are these made for babies? I ordered a pair for my son's lyrical dance. I read all of the reviews and noticed they ran small, so I ordered an XL. I was SO mad when I opened the package and found little teeny baby foot undies! Where in the world do the makers get their sizing information from!? My son has a size 2 foot in street shoes and these fit my son's first three toes, that's it! I would not recommend these to anybody! Don't buy this product if your child has a foot larger than a toddler's! These run so small I don't know who can wear these! My daughter uses these for Acro. By the size chart I should get her a large but when I saw the small size on someone else I bought an extra large . They were so small I couldn't even get them on her little sister! By the size chart, they should be the same as an adult P but the P was much larger. I just buy adult S now. They don't last a super long time before falling apart but she's picky about tumbling shoes so we just have some backups. The quality is excellent as I would expect from Capezio. They have worked well for my daughter for her Acro class. However, I agree with other reviewers that these run VERY small. My 7-yr. old has little feet (toddler size 10) and the mediums are way small. I stuff her feet into the size mediums, because fortunately she's not picky about tight shoes! But I'm on the website right now to order at least one, maybe two sizes bigger. Cheap, but I'd rather not have to buy a pair every month because they fall apart. After reading the reviews, we decided to order the XL for my daughter. She wears a child size 11. I thought I was following the others advise but, the size was still too small. I am returning them for the adult P. The shoes look great, and I know she will love them once she has the correct size. I like these shoes a lot but they run really small. Get a few sizes bigger but otherwise they're great! I don't like these very much. They rip way, way easy so if you are a hard working dancer, I don't think you should use them! I bought these for my daughter and have never had a problem with them. This is her second year wearing them and they are still in great shape. We just received the FootUndeez and they run small. I took the advice of another on here and ordered the XL and it is tight on my daughter. She wears a street size 1. It's all she can do to get it on her feet. They look well made and she does love them. She just has trouble getting them off and on. This is a great product that lasted me a long time and it comes at such an affordable price! I got some at another store for thirty dollars and these ones are only fifteen dollars. I use these shoes often and perform on gym floors and on marley floors. The downside about them is, sometimes they don't turn with you and by the end of a dance, they are almost off of my foot. They are very comfy too! These are my FAVORITE shoes in da universe. So be it!! k!! You will need to fill out your original invoice and specify on the backside what you are sending back, and why you are sending it back.